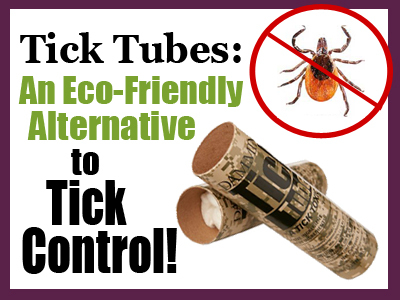 Tick Tubes- Giroud's Eco-Friendly Alternative to Tick Control! Ticks have woken up from their winter slumber and they’re ready to start feasting and multiplying! Last year, the CDC (Centers for Disease Control) reported that illnesses and diseases from these pesky insects have tripled in the United States in the last decade! This alarming study also highlighted new tick-borne diseases, such as Alpha-Gal syndrome. We all need to do self-checks for ticks after we’ve been outside. But there are also some great preventative steps homeowners can take to greatly reduce the tick population on their properties. The insect control experts at Giroud offer a wide variety of tick control options, including both organic and traditional sprays. However, some homeowners prefer no-spray options or they want to supplement their spray programs with additional control. Read on to learn about Giroud’s eco-friendly option for tick control! Warming climate trends lead to longer insect seasons, which gives these bugs more time to multiply. Animals and shipping materials transported from one country to another often spread these insects. You can take steps now to greatly reduce the number of ticks on your property, and Giroud offers a variety of options! Many homeowners don’t like to think about mice on their property, but the reality is they are everywhere. They’re building their nests in hidden places you probably don’t even notice. Mice will gather soft materials to build their nests, like leaves and brush. They’ll even tear apart fibrous materials like cardboard and paper sitting outside in your recycling bins and bring the bits back to their nests. Damminix Tick Tubes are small cardboard tubes filled with cotton balls that are treated with a product called Permethrin. Mice pull the cotton balls out of the tubes and use them to build their nests. 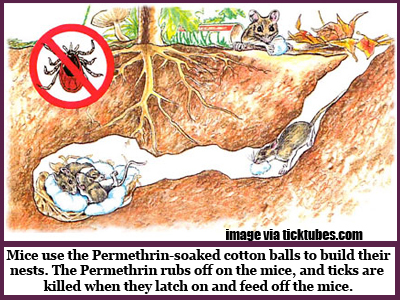 The Permethrin rubs off on the mice, and the ticks are killed when they latch on and feed off of the mice. Permethrin is safe for mice and any other animals, such as dogs and cats. In fact, this process is much like the flea medication you might put behind the ears of your dog or cat. Plus, Damminix Tick Tubes are EPA approved and biodegradable, so they are environmentally friendly! Your Giroud Tick Control Expert will do a full assessment of your property to determine where mice are likely to search for nesting materials. Then, he will strategically install the tick tubes in discreet locations. In time, you can expect to see a vast reduction in the amount of ticks on your property using the tick tubes! If you are interested in spray options, Giroud offers both organic and traditional programs. Our tick control experts will target the “Hot Spots” around your property where ticks love to hide. Then, we treat the perimeter of the yard, killing the pests on contact and the residual will continue to repel ticks for several weeks. Click here to learn more about Giroud’s Organic and Traditional Tick Control Sprays. Giroud also recommends pruning back branches to let more sunlight down on your lawn because ticks love to hide in shady spots. Cleaning up debris and brush where ticks hide and breed will also decrease the amount of these insects on your property. A Giroud expert will conduct a FREE full property evaluation and suggest the best program for you. Whether it’s spray treatments, tick tubes, or combination of both, you can trust that the program will be skillfully prepared and tailored for your property’s specific needs. Call 215-682-7704 today to get started!